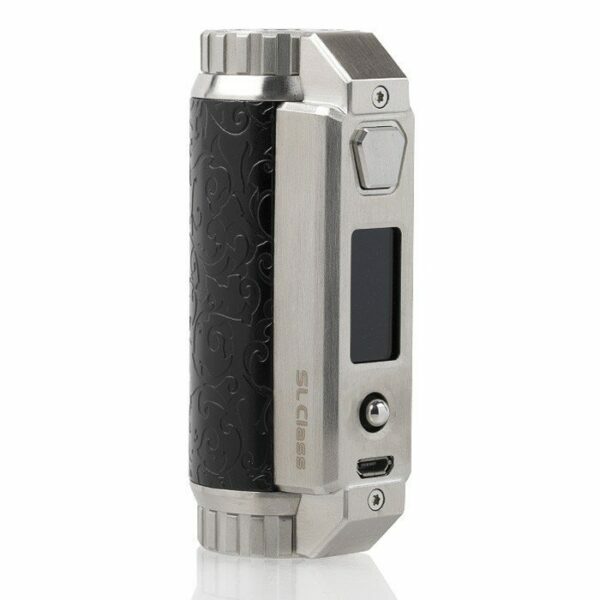 Before I dive into this review for the YiHi SXmini SL Class Vape Mod I thought I should state upfront that although YiHi is using a brilliant chipset that allows a single cell to output up to 100W, there can be no doubt that some of the features in the SL Class mod itself seem to be a step backward. If you’re as enthusiastic as I was when first seeing the photos of this beautiful piece of technology, there are a couple of things you should know upfront. Firstly, Bluetooth is NOT currently available in the SXmini SL Class, despite being listed on various vendor “specs” sheets and even inside the “Upgrade and Bluetooth” manual tucked away inside the SXmini box. At this point, I’m not even sure a Bluetooth module is on the board, and if it isn’t, well, even a firmware upgrade can’t activate a module that isn’t already there. However, if YiHi did in fact install a Bluetooth chip on the board, then yes, it could be activated via a firmware upgrade, at some point. I’m not very confident that this mod has a Bluetooth module on board. And that can be a big disappointment. I own the YiHi SXmini G Class (reviewed here), which does have Bluetooth, and using the SXi app on my iPhone is the only way I adjust the mod. The YiHi SXmini SL Class SX485J 100W Box Mod is a luxurious vape mod from YiHi's so far unrivaled line-up, utilizing a single 18650/20700/21700 battery platform with a premium frame chassis and high-end grip design. Making various adjustments to wattage, temperature control, and so on, can be accomplished with the joystick that functions as the equivalent of adjustment “buttons” found on other mods. It takes practice to use the joystick, but it’s certainly do-able. Still, having access to all the settings, memory slots, and so on, in a smartphone app is one of the most appealing features of the expensive YiHi SXmini series. Without Bluetooth the YiHi SXi app can’t be used by the SL Class. If you’d rather not use the joystick, then you can download the very buggy Mac (beta) or non-buggy PC SXi software and use it to adjust and set up the memory slots. You’ll need to attach the SL Class to your computer with the included MicroUSB cable. Because I use only Mac computers, I downloaded the SXi software for Mac, and installed it on a 2018 MacBook Pro using the MacOS Mojave Public Beta 3. The app does work occasionally, but only occasionally. Hopefully YiHi will continue to work on the Mac beta version so that users can navigate the menu system through the software. PC users should be able to do just fine with the PC SXi software. Considering the substantial price tag of the SXmini SL Class, YiHi certainly should have included Bluetooth so owners would have access to the SXi smartphone app. Another disappointment with the SL Class is that YiHi has reverted back to the older MicroUSB port and cable for this model instead of using the tried and true USB-C port and cable seen in the SXmini G Class (reviewed here). Again, I have to say that the SL Class is an expensive mod and losing the Bluetooth module and reverting back to MicroUSB is definitely a misstep for YiHi, and it could spell disaster to the SL Class mod sales. I know I’m making it seem as though the SL Class isn’t even worth the effort to review it, but there are plenty of positives about this mod, and I’ll discuss them below. When I was assigned the SL Class for review purposes I expected it to have Bluetooth and use the USB-C post/cable, so this is a big disappointment to this reviewer, but it’s not necessarily a deal-killer. In fact, I love using it, though not nearly as much as the two newest mods in my collection, the Lost Vape Triade DNA250C (reviewed here) and the aforementioned G Class Mod. 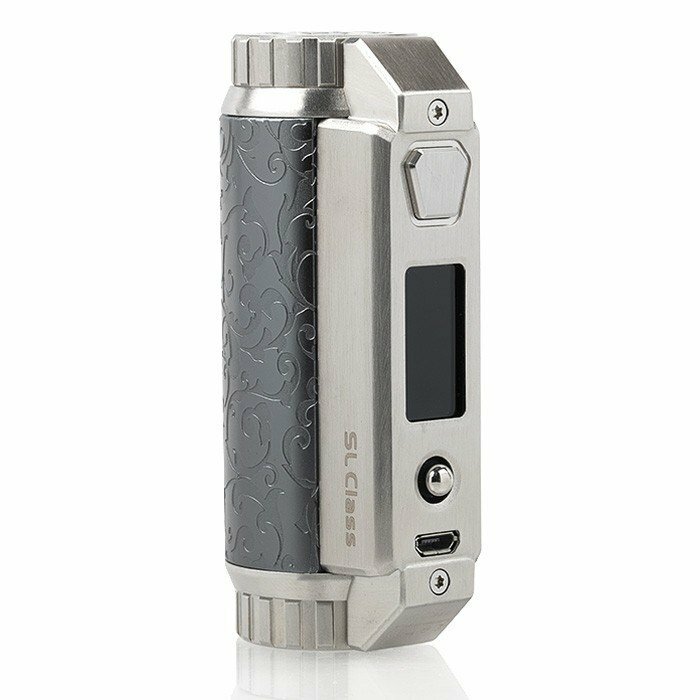 The YiHi SXmini SL Class is a single cell mod, making use of one 18650, or 20700, or a 21700 cell. 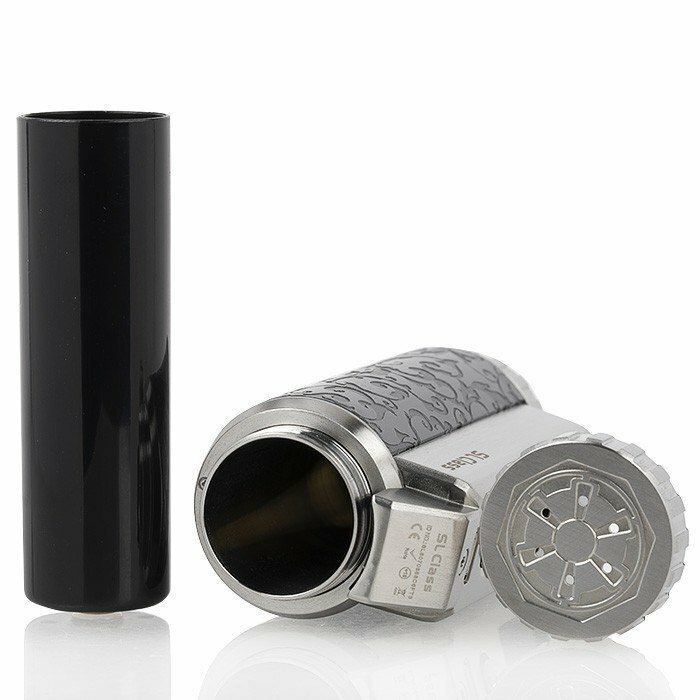 Users that want to stick with the 18650 can use the plastic full-sleeve 18650 adapter, and as long as the 18650 battery is 35A or above, the SL Class can still achieve the full 100W. Most “multi-battery platform” mods will limit the 18650 to 80W, while providing 100W to the large 2X700 cells. The YiHi SXmini SL Class mod is one truly gorgeous mod, whether it’s the carbon fiber finish or etched stainless-steel/aluminum finish. 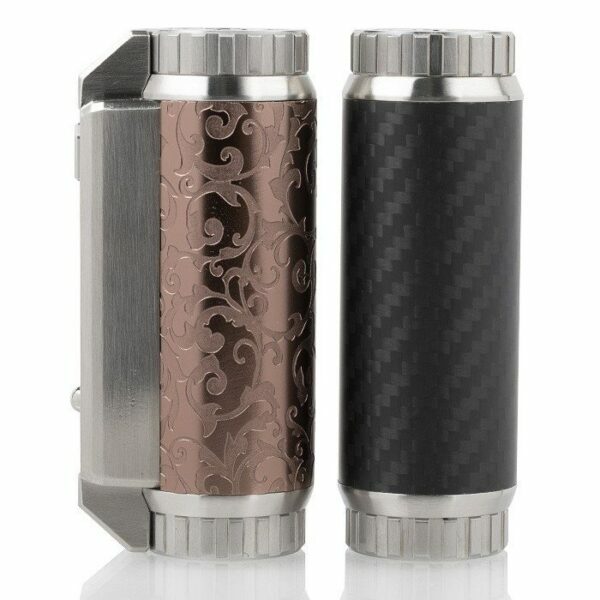 The most elegant models are the aluminum etched models, available in a “coffee”, “black” or “gray” etched-aluminum finish. The most expensive SL Class is the “stabilized wood”, or stab-wood models. YiHi is asking a premium of $40 for the stab-wood model. Owners of the SL Class can operate the mod in Novice Mode or Advanced Mode. The Novice mode turns the SL Class into a strict variable wattage mod, while the Advanced mode offers temperature control features, Bypass mode, and so forth. There are various “moves” the user can make with the joystick to maneuver these settings, but again, the Mac or PC software makes it so much easier to set up. The SXmini SL Class uses a simple 5-click system to turn on the mod. Once on, the user is presented with the main screen which includes readings of the current wattage or temperature, the resistance of your chosen coils, the voltage, amperage, the joules, your vape strength setting (soft, powerful, etc. ), the memory setting, and a battery indicator along with the battery voltage in real time. To adjust any of the above settings, the user makes use of the joystick. Select the setting you want to change by highlighting by moving the joystick and clicking the joystick, then push up, down, or side by side to change that setting. To enter the Novice mode, the user simply holds the joystick to the left for 3 seconds. When entering the novice mode, the screen changes and shows just the current wattage, battery voltage and battery indicator, the resistance of the coil and the real time voltage. Unless you make much use of temperature control, I would recommend the Novice mode. I didn’t experience much, if any, difference in performance between novice and advanced mode, although many more adjustments can be made in advanced mode in order to finely tune the mod to your optimal vape. 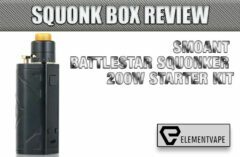 Both Novice and Advanced modes can fire up to 100W with any of the 3 battery types. 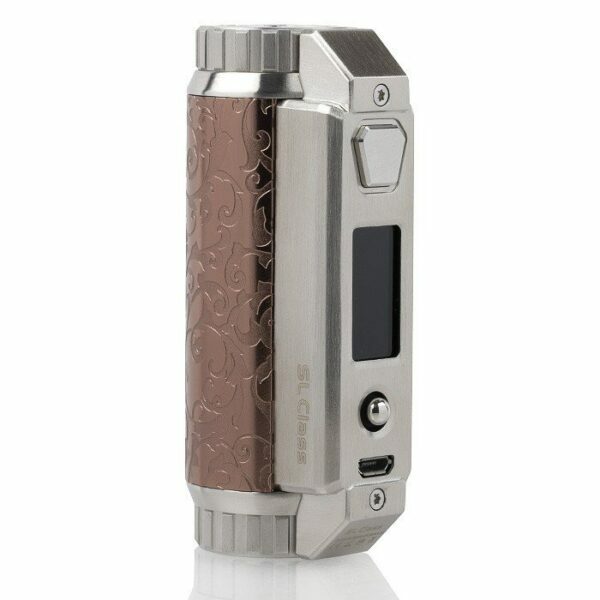 YiHi chips are well known in the vape community for their tremendous accuracy in wattage and (especially) temperature modes, so anyone looking for a single-cell mod with very accurate temperature control will be delighted with the results from the YiHi SXmini SL Class Mod. Because we’re also currently reviewing the new Resin Edition of the Horizon Falcon (review coming), I decided to use this sub-ohm tank for the SL Class review. This high-performance, A+ tank is spectacular and performed exceptionally with the SL Class mod. I used this tank in Novice and Advanced Modes and found the mod and tank work together really well. 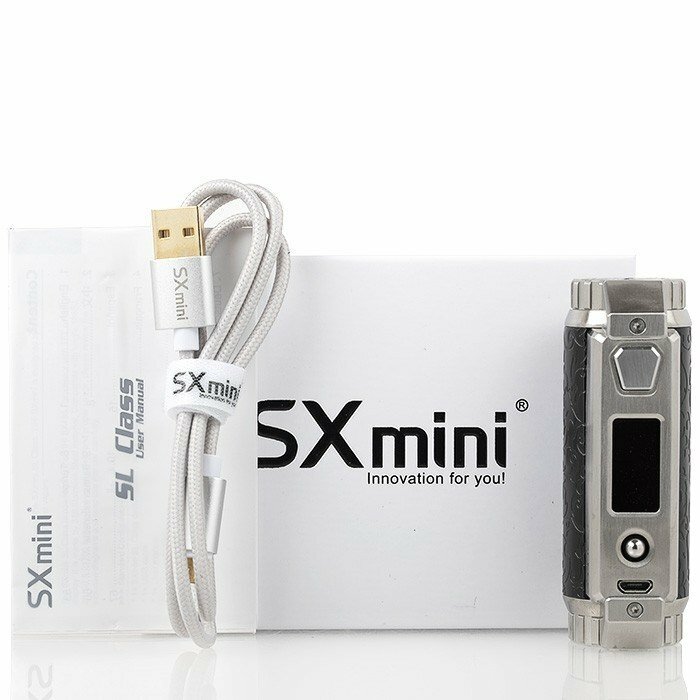 The SXmini SL Class vape mod is designed with a cylindrical look wrapped around the battery compartment with a square front end for the screen, fire button, and joystick.. and the USB port. This port is used for firmware upgrades and battery charging. The battery chamber is certainly large enough for a single battery mod, but because it can 3 types of batteries, including the larger 21700 cell the battery chamber is just right. On the top of the SL Class sits a 510-thread with a spring-loaded pin. On the base of the SL Class is the battery cap. The threading is on the rough side, but it does have good venting to keep the battery cool. I can’t help but feel that despite how beautiful the chassis is, how well built it is (except for the rough battery threads), the SXmini SL Class is a big mistake for one of the finest mod makers in the business. I still use the mod, but it’s such a step back for YiHi that, if indeed there is no Bluetooth module on the board, then nothing can make the SL Class worth the present price tag, especially if you spring for the stab-wood version. I would love nothing more than to talk to the product manager and find out why the SL Class seems to lack a Bluetooth module and why they didn’t use a USB-C port. 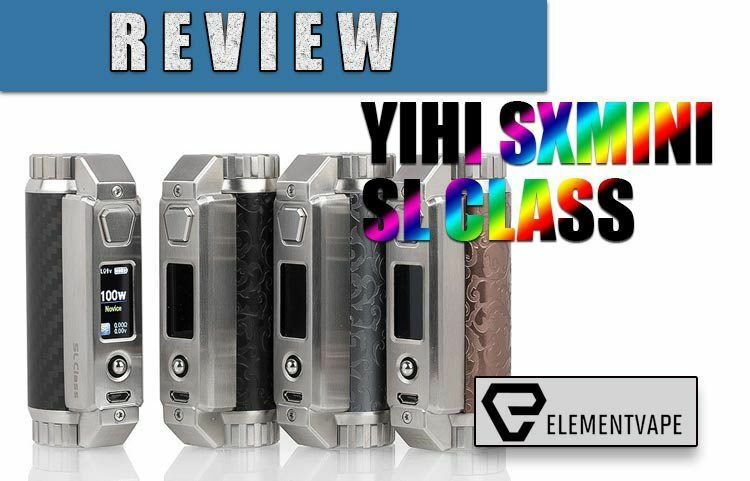 If the YiHi SXmini SL Class sold for under $80 it would have scored an A+, but lacking the modern features of other YiHi mods, yet priced the same as these ultra-advanced mods, the final score is…. 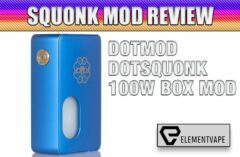 Want to buy this beautifully machined, ultra-accurate 100W mod? Pop over to Element Vape and pick one up. If you’re fine with the usual MicroUSB port and no Bluetooth support, and have deeper pockets than me, you’ll love the SL Class. Hell, I love it, but it’s still disappointing.